Deep-fried Laos style spring rolls served with plum sauce. BBQ chicken marinated in Thai herbs, served with peanut sauce. A subtle blend of minced fish, mild red curry, lime leaves, beans, Thai herbs, served with a cucumber sauce. Minced fish, mussels, scallops and pork. Deep-fried and served with sweet chilli sauce. Moneybags with minced chicken, ginger and peanut, served with plum sauce. Deep fried pastry turnovers with a filling of minced chicken, kumara, onion, curry paste and herbs with sweet chilli dip. A mixture of cabbage, spring onion, coriander, carrot and savoury chicken. Wrapped in rice paper, served with a chef's special sauce. Deep fried tofu with peanut sauce. BBQ pork meatballs with a sweet tamarind sauce. Appetisers - one of each: Poh Peah, Toong Thong, Satay Gai and Tod Mun Pla. Appetisers - one of each: Poh Peah Satay Gai, Toong Thong, Satay Gai, Luk Chin Moo Yang and Thalay Ja. Grilled tofu, mushroom and pumpkin served with a potato savoury sauce. Hot and sour soup with lemon juice & chilli. Coconut milk soup with galanga, mushroom, lemongrass, cabbage, kaffir lime leaves & chilli. A non-spicy clear soup with celery, cabbage, spring onion and pepper. A well known Thai curry with assorted vegetables. Flavoured with green curry paste, kaffir lime leaves, basil, chillies, coconut milk and eggplant. 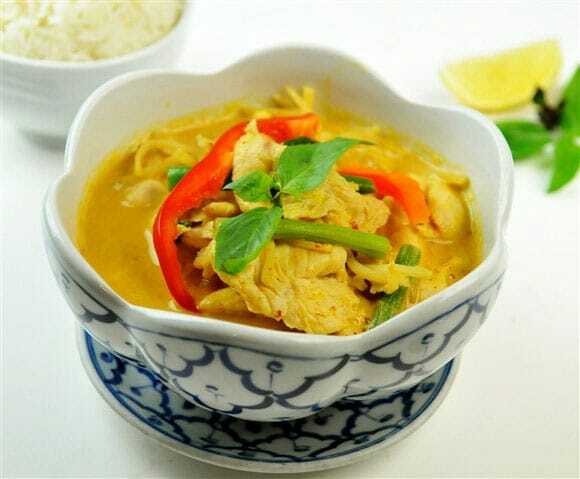 Traditional classic Thai curry using a red curry paste cooked with coconut milk, basil and assorted vegetables. An aromatic yellow curry with potato, onion and coconut milk. Laos style country curry (without coconut milk) served with selected vegetables & mixed herbs. Always a favourite. A delicious warming curry with crushed roasted peanuts, coconut milk, beans, capsicum, kaffir lime leaves, sliced pumpkin & sweet basil. 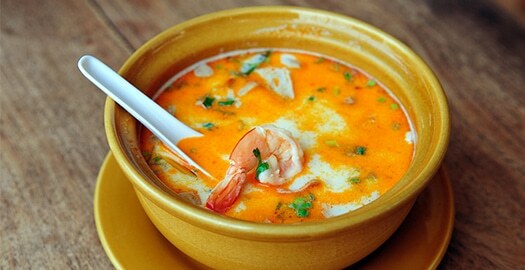 A smooth sweet red curry with tender cubes of meat, potato, onion, peanuts and coconut milk. A red curry with sliced roast duck, coconut milk, pineapple pieces, grapes, tomato, basil and chillies. Succulent salmon fillets cooked in a spicy creamy green curry. Served with fresh seasonal vegetables and garnished with crispy basil leaves. Stir-fried prawn cutlets with red curry, beans, kaffir lime leaves and capsicum. A delicious red chicken curry with mango, capsicum, tomato and onion served with roti and noodles. Stir fried mixed vegetables with contrasting flavours of tomato and pineapple in a sweet & sour sauce. A combination of 3 different tastes: sweet, sour & chilli. Served warm with assorted vegetables. Stir fried vegetables with chilli, basil, and strong garlic flavoured sauce. Famous Thai dish, stir fried mushroom , onion, capsicum,spring onion, baby corn with cashew nuts and oyster sauce. 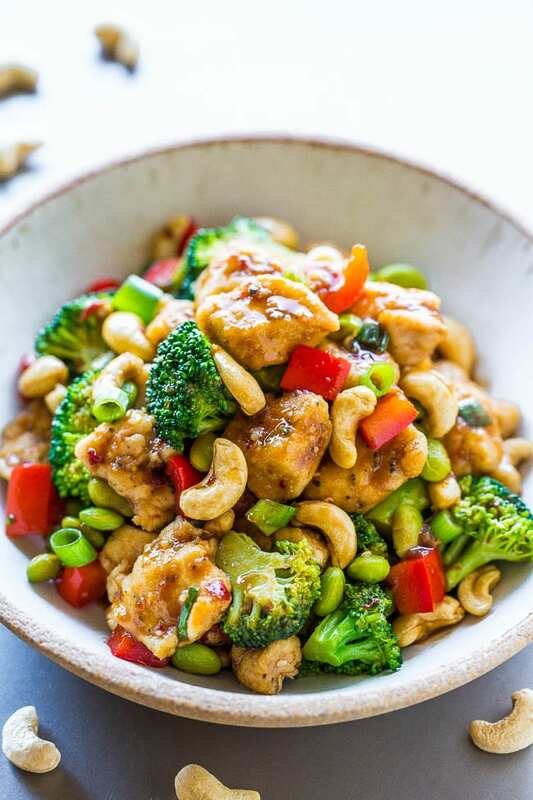 Assorted mixed vegetables with a creamy peanut sauce. Sauteed with green beans, capsicum, onion, chilli paste, basil and kaffir lime leaves. Sauteed with country chilli paste, basil, beans, lime leaves and pickled galangal. Sauteed with ginger, spring onion, mushrooms, capsicum, onion, soybean paste and oyster sauce. Choice of chicken, beef or pork minced and poached. 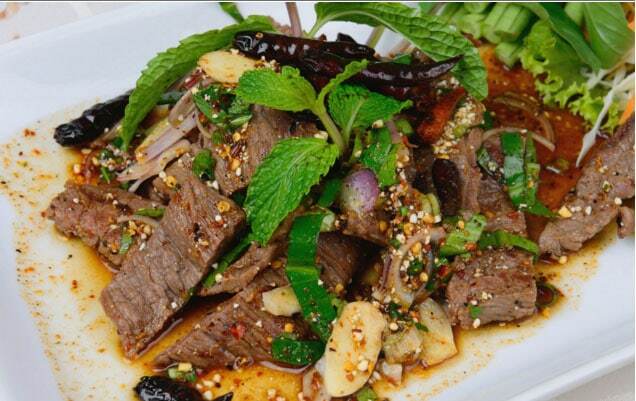 Mixed with roasted ground rice, chilli powder, mint leaves, spring onion, onion, coriander, fish sauce and lemon juice. Prawns, scallops and squid with fresh chilli, mint, onion, spring onion, coriander, roasted ground rice, lemon juice and fish sauce topped with sliced cucumber. Deep fried whole snapper covered with a mixture of chilli powder, fresh chillies, mint, lemon juice, fish sauce, roasted ground rice, kaffir lime, leaves, coriander, onion, spring onion and topped with sesame seeds. Prawns served with onion, spring onion, coriander, lemongrass, kaffir lime leaves, chillies, mint, tomato, roasted ground rice, fish sauce,lemon juice and cucumber. Served with lemon juice, mint, coriander, cucumber, red onion, tomato, spring onion, chilli and lemongrass. Crispy whole black tiger prawns, crispy tarakihi pieces, crispy squid with red onion, chilli, lemongrass, lemon juice, coriander, spring onion, celery, mint and tomato topped with cashew nuts. Fermented Laos sausage with ginger, peanuts, coriander, spring onion, chilli, lemongrass, lemon juice, mint, cucumber and onion. Raw Prawns marinated in lemon juice, chilli, garlic and fish sauce. Served with spicy chilli sauce and cucumber. BBQ chicken breast sliced and mixed with coriander, mint, chilli powder, red onion, spring onion, and roasted ground rice. BBQ marinated steak sliced and served on a bed of lettuce with a spicy sauce. Deep fried tofu with lettuce, tomato, cucumber, lemongrass, celery, red onion, spring onion, bean sprouts, coriander, lemon juice and fresh chilli. Sauteed pieces of sirloin beef with garlic, oyster sauce, soy sauce, bok choy, broccoli and sweet chilli sauce. Served on a sizzling platter. Stir fried roast duck with garlic, chilli, onion, beans, capsicum, bamboo shoots, sweet basil and whisky. A sauteed mixture of seafood with fresh chilli, garlic, chilli paste, onion, spring onion, mushroom, oyster sauce and tamarind sauce. Sauteed fried pork belly with chilli, garlic, basil, onion and capsicum. Stir fried broccoli, bok choy, red capsicum, garlic and soy bean paste. Thai style fried rice with egg, onion, beans, capsicum, spring onion and tomato. Fried rice with tom yum paste, assorted vegetables and green leaves. 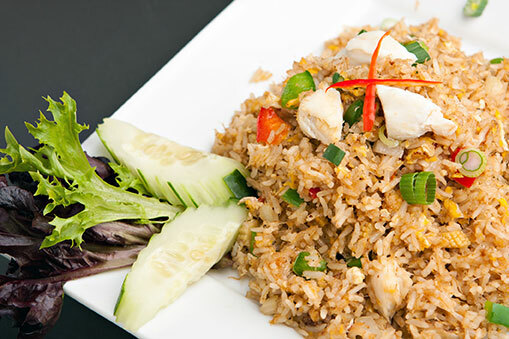 Fried rice with red curry, assorted vegetables and green leaves. 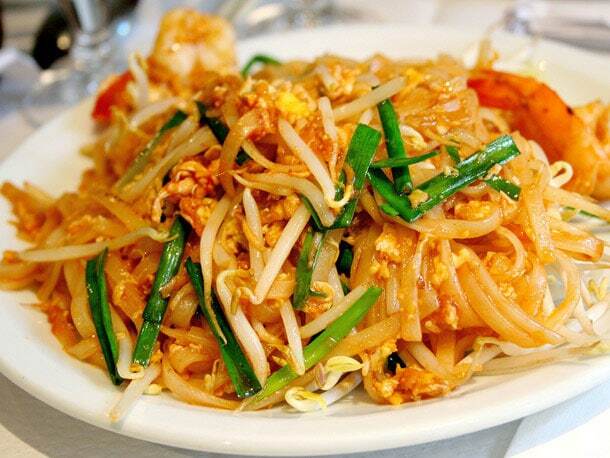 Flat thin rice noodles with eggs, peanuts, tofu, bean sprouts and chives. Stir fried spicy rice noodles with vegetables, eggs, chilli, basil and whisky. Wok fried soft flat rice noodle with eggs, broccoli, carrot, bok choy and sweet soy sauce.